Bringing 50 years of innovative solutions to designing, making & repairing of things for domestic, automotive, industrial and commercial use. On site only in Auckland. Anywhere if you send the item to me. Use my 50 years of extremely diverse experience to sort out your problem! I have broad metal working skills covering simple brackets to complex constructions. Handrails, balustrades etc from your back steps to high rise buildings. Designed and built retro style sports cars for 40 years, repaired and modified vintage, hot rods & speciality vehicles. 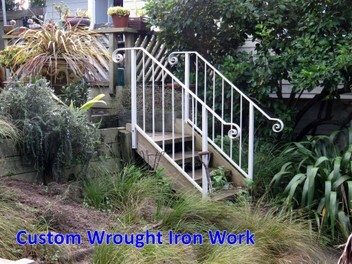 Fabricated reproduction brass items, wrought iron fences, gates and furniture. Experience in fibreglass, painting, general engineering. Can't find someone to deal with your problem? Call me - I MIGHT be able to help – if not I can usually suggest a solution, a person, a business or a product for you. Alex did most of the build on my replica 1937 Swallow SS100. It was a new design and most of the chassis and body work had to be handmade. His attention to detail, problem-solving and passion for his work was simply exceptional. When I took my car for certification, the certifier called other staff to look at the vehicle as it was, in his view, "The best constructed kitcar" that he had ever seen. I highly recommend Alex to anyone.